Hooray! 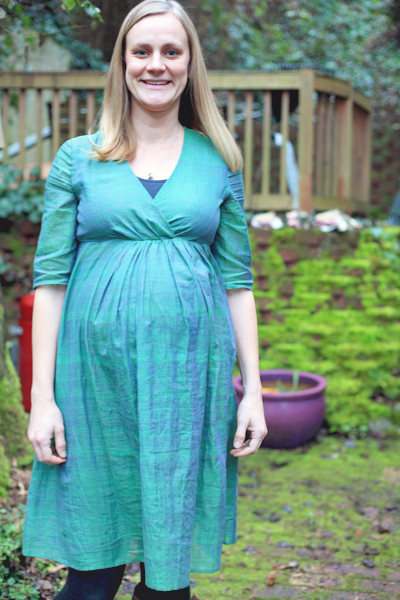 I finally finished the Aurora Dress, the one I’ve been planning since early fall! And, would you believe that it does in fact fit my pregnant self just like I’d hoped?! Fitting around my belly is no small feat these days considering how large I’ve gotten. It’s mind boggling that my belly can expand the way that it has, but I guess there is a little being in there – one that I should be meeting sometime in the next month! I’ve definitely taken my time making this dress. Just to remind you, my original inspiration was the fabric, a green and purple cross-dyed voile from FineFabrics.com. I chose Simplicity 2145 because I thought it would convert nicely from a non-maternity pattern to a maternity dress and then hopefully eventually back to the non-maternity dress it was meant to be. You’ve already read about my adventures pre-washing the fabric, making a muslin, and modifying the muslin – all of which took place over a month ago! You see, once I was happy with the muslin, it took me forever to build up enough courage to cut into the fashion fabric. What pushed me over the edge was attending a sewing meet up with some lovely ladies who are part of the The Seattle Sewing Guild Meetup Group. I took advantage of their positive energy and large tables to make that first snip into the fabric. Because the fabric is a bit sheer, I ended up cutting doubles of the front top pieces, the back top pieces, and the back skirt piece. I was planning on treating the double layer as one piece, sort of like you would with an underlining, but then I decided half way through construction that I would instead treat the double layer as a sort of lining so that I could hide nearly all of my interior seams. It meant a lot of hand sewing because of the way I’d already started putting everything together, but I think it was worth it. And, I have to admit that I am quite pleased with the neat interiors. I also hand stitched an invisible hem on both the sleeves and the skirt. To ensure that the skirt would fit over my expanding belly, I ended up adding 10″ of extra width to the center front. Yes, you read correctly – 10″!!! After conferring with a sewing friend, I was reassured that the lovely soft drape of the voile would handle the gathers (and my belly!) well, much better than the muslin would have ever been able to predict. As you can see above, there’s still extra ease in the dress, but not that much considering how much fabric should be there! I’m not sure how well you can see it above, but the side seams fall naturally down my side, which is further confirmation that the extra 10″ was really what I needed! 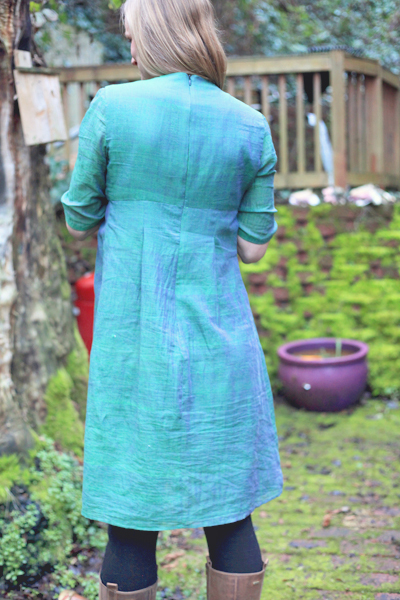 I didn’t change anything to the back that I hadn’t already done in the reworked muslin. As I mentioned then, instead of sewing the pleats down the length of my back as the pattern suggested, I only sewed them a few inches. Just enough for them to hold their shape at the top. Now, to be completely honest, I did make a few mistakes. Though I removed the gaping in the bodice front by using an invisible dart when I reworked the muslin, I worried that it pulled the empire waist line too far up in the front, so I tried to add a little bit of the length back to the bottom of the bodice when I transferred the muslin changes to the pattern. I must not have done it quite right because the gaping came right back. I was able to eliminate a majority of the gaping by essentially removing the length that I added to the bottom center of the front bodice pieces, but in doing so I destroyed the markings that I made for the front center and the bodice front pleats. Though the bodice no longer gapes, it is a bit more revealing than I expected based on the fit of the final muslin, a result that I’m chalking up to the loss of the correct center front placement. In addition, the interlocking front bodice pleats that were one of my favorite features in the original pattern were also lost. Forming the interlock involves cutting into the bodice, and I just didn’t trust myself to make the cut after all the bodice drama I’d already had. If only I had just stuck with the changes I knew would work from the muslin! One other mistake I made has to do with the sleeves. After trying out the long sleeves in the muslin, I decided instead I’d just go with something a bit shorter but still wintery. If you recall, the long sleeves had this potentially interesting pleat in them. When I shortened the sleeve pattern piece, I assumed that the pleat added unnecessary ease, so I folded it out, hinging the fold at the top center of the sleeve piece. Unfortunately, I now know I should have either left the sleeve width as is or just pinched out the pleat somewhere below the armscye since the sleeves as-is are now a bit too tight across my shoulders. You can see the crease lines from the wearing tension in the photo above. It’s actually not so bad, but I’ve mentally made it worse since I know it wasn’t supposed to be that way! The pattern was drafted just fine, but I thought I knew better! 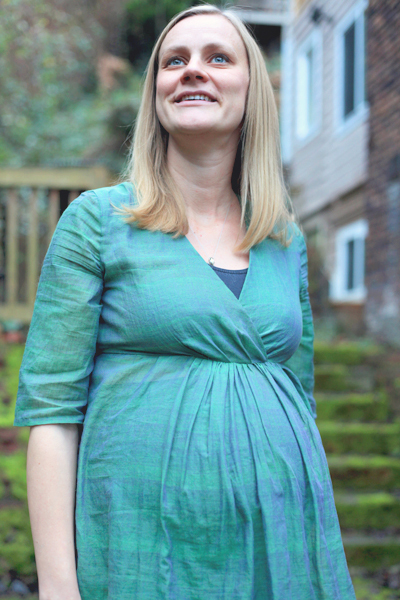 If I actually follow through with my plans of un-maternityifying this dress when my pregnancy days are over, I’ll likely also go in and either remove the sleeves or turn them into little cap sleeves. 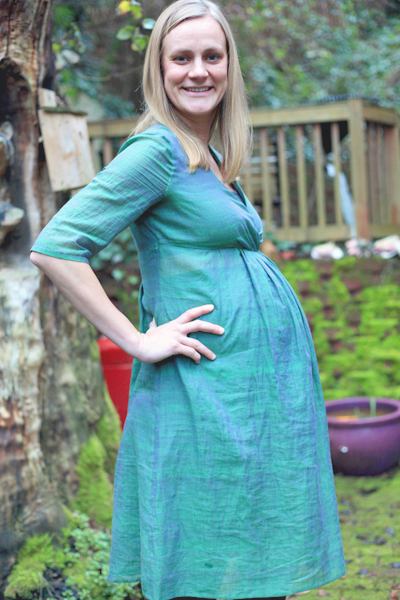 My winter aurora maternity dress will become a summer aurora dress! Until then, I am so very happy to have another fun dress to wear during this last month of giant belly. It reminds me of the baby moon my husband and I took in search of the aurora, and it makes me feel fancy and dressed up when I might otherwise be inclined to feel sluggish and top heavy. 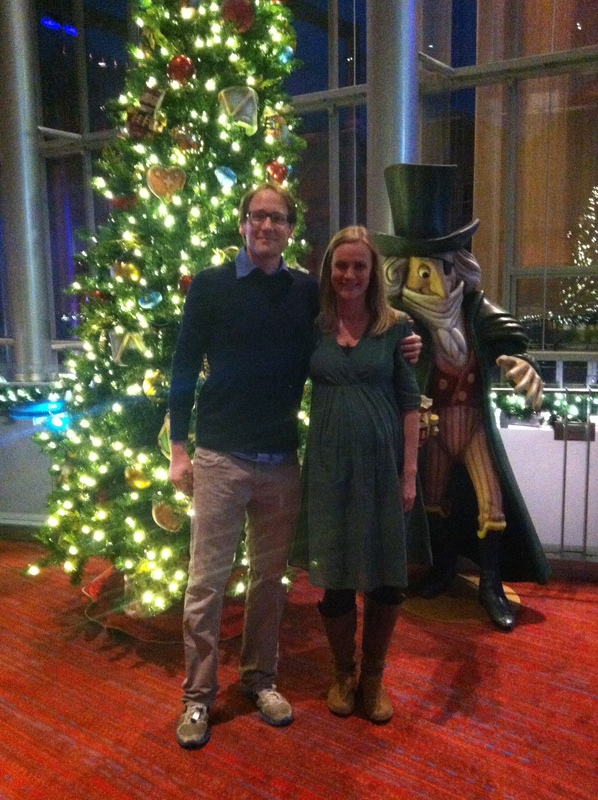 I was proud to wear this dress twice last week – once to a Christmas eve service and once to the Pacific Northwest Ballet’s Nutcracker. Here’s to finding as many occasions as possible to feel fancy in the new year! Finally, even though this dress was planned long before the Sewcialists announced Sew Green December, I have to credit their Sew-Along as one of the driving forces that helped me to keep cranking away at the hand sewing there at the end and to get this post up before the end of the month. Thank you for your fortuitous choice of green for the month of December! Gorgeous dress, your hard work paid off, great job. 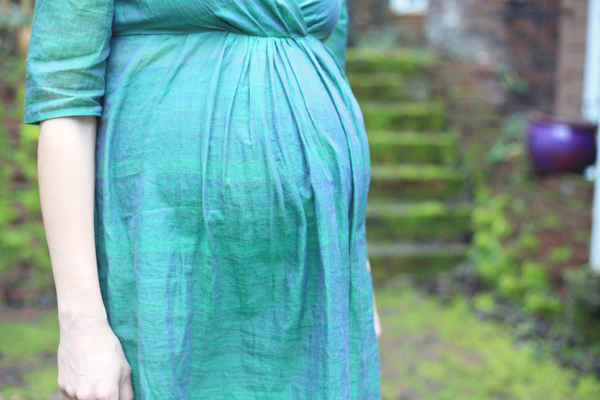 This dress is definitely a lot more fun than the maternity wear that you can buy in shops! Well done! It’s lovely! And the color of the fabric is really pretty. Beautiful dress, Amy! It’s nice to be able to dress up at the end of your pregnancy. Oh, Nutcracker! Such a wonderful ballet. Talking ballet: my new lace skirt got it’s first wear at the Christmas performance of Dutch National Ballet. Sleeping Beauty, about…..princess Aurora! Beautiful dress and you look very nice!!! Beautiful work, Amy! That fabric makes you look so glowy and bright-eyed (or is that just the effect of pregnancy? ;)), I love it! Beautiful dress, beautiful mama! You look absolutely radiant, Amy. It’s wonderful! I love the purple sheen that comes through, even in photos. You look beautiful! Beautiful dress. And it will be perfect to transition to postpartum and nursing! Looks lovely. Happy new year! The dress is lovely and I’m so glad that it fits! Be kind to yourself these last couple of weeks and enjoy the last “couple time” you will have for awhile. Before you know it the little one will be here and making it’s presence known! Have a wonderful, happy, healthy and blessed New Year! It is so pretty. You done a wonderful job! 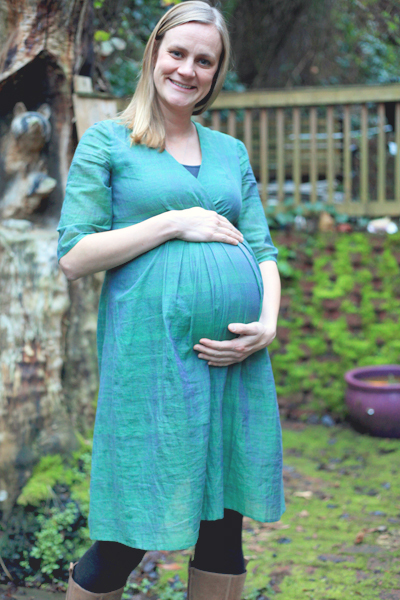 What a gorgeous dress — and you look radiant — great job, and here’s to a wonderful 2014 and a healthy, happy little one!! Absolutely gorgeous dress, I think everyday should be a good enough excuse to wear it, especially if it makes you feel special! Wow, this looks great! I’m so glad that it fits and looks amazing to boot! Happy New Year, and welcome, little one! So beautiful! The fabric is amazing, and the cut of the dress is gorgeous on you. Congrats on the imminent arrival of your baby, and Happy New Year! Amy you look just beautiful in that dress! Great job. I sure have enjoyed reading your posts this year. Your attention to detail always inspires me to sew. I hope you have a lovely new year’s celebration and enjoy your month getting ready for the new family member. Enjoy! It’s such a wonderful time of life and it just gets better and better! Blessings.and joy to you! Absolutely Gorgeous! I am really glad you continued with it instead of waiting until after the baby is born. It looks like you felt radiant in it. My guess is Girl . absolutely fantastic! You look fabulous and I can’t wait to meet your little one this month!! It turned out very beautiful! I love the fabric you use, so pretty! It turned out beautifully! Love the fabric especially! 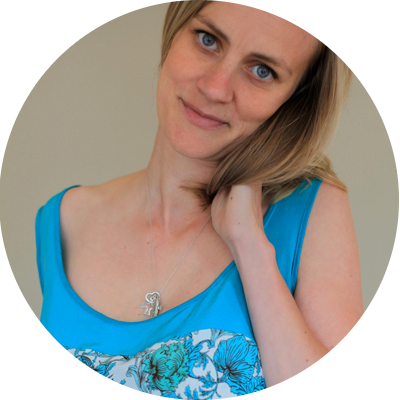 I can’t believe it’s taken me so long to read this post – but it turned out BEAUTIFULLY!! You look stunning, and that fabric is really something special! Congrats! !